I didn’t see a firefly until I was 31 years old. Of course, like any child who had seen them in the movies or depicted in animation, I was captivated by the idea. A bug that lights up! Magic! And, even at 31, my childlike wonder was ignited when I peered into a dense Costa Rican jungle and saw those teeny, split-second flashes of iridescent light. A flash, a pause, another flash, then darkness again. Over here…no…over there…the entire jungle twinkled like a Christmas tree. Knowing about fireflies was nothing like actually experiencing them. It’s common knowledge that some organisms in nature have a mystical ability to produce their own glow. But, when you’re surrounded by the reality of it, well, it almost seems as if you’re in another world. No matter the source, bug, fish, fungi or mollusk, they all produce light by the same means. Each of these unique organisms has a light-emitting pigment that reacts chemically with an enzyme to create what we commonly call bioluminescence. While the child in me loves the sight of a firefly, the absolute best bioluminescent experience is immersing yourself in water that sparkles and dances around you with luminescent zooplankton. If you’ve ever looked up into the sky on a dark night and wondered what it would be like to “swim” among the stars, bioluminescence is as close as you’re going to get down here on the Blue Planet. Personally, I think this experience should be on everybody’s bucket list. And, for those of us lucky enough to live near, or visit, the Oaxacan coast, this experience is an easy item to check off, because there are two areas known for their bioluminescence within easy striking distance of both Puerto Escondido and Huatulco. The Laguna de Manialtepec (less than 20 kilometers from Puerto Escondido) is a rare estuary ecosystem that stretches out along the coast. During the rainy season, the water floods the lagoon, and acts as a trap, concentrating the bioluminescent microorganisms, the reason for the spectacular light show you can experience here when the sun goes down. Peer into the inky, dark water upon first arriving and it will seem as if nothing special is going on. But dip your hand in and move it around and it will look as if you are pulling galaxies of stars through the water! Dive in and you are literally bathed in light! The action that causes the bioluminescence to occur is the agitation of the organisms in the water, and at concentrations this high, even the slightest of movement sets off a veritable “electrical storm” of iridescent blue light, forming around whatever disturbs the water. Jump, splash, swim, run, kayak, blow bubbles, whatever you do, it’ll be surrounded by luminescent, glistening light. The second dazzling gem is located within the Chacahua Lagoons National Park, 54km west of Puerto Escondido. 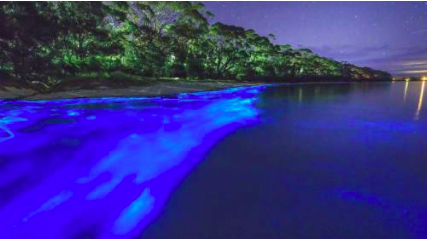 Nearly the entire watery expanse of the park lights up during the rainy season with dinoflagellates, the plankton responsible for the mysterious blue-green glow. As charming and remarkable as these glimmering micro lights may be to us, would you believe that, for the creatures themselves, the glow actually acts as a defense mechanism? These little microorganisms, being some of the lowest on the local food chain, use the brilliant flashes of light in hopes of either scaring off predators or attracting the attention of their predator’s predator, and living to light up another night. The beauty of this extraordinary bioluminescence is so captivating, one can fall into an almost hypnotic trance just watching the waves roll up and down the shore. Each wave painting a new galaxy, ever so briefly, on the canvas of the sand, only to be washed away a second later by another, and another, each surge accompanied by a symphony of frogs and crickets. Of course, you’ll want to catch this awesome spectacle of nature at just the right time, so plan to visit during a new moon and at the height of the rainy season May – September. And be prepared for an “off the beaten path” experience in order to fully enjoy this trip. You can arrange your own transportation and look for a local guide once you arrive at each of these lagoons. To get to the Laguna de Manialtepec, you take an inexpensive collectivo (local “bus,” usually a modified pickup truck) from Puerto Escondido and you’ll arrive in less than 30 minutes. A private taxi will take a little less time, but cost you a bit more. Most visitors get to Chacahua by way of Puerto Escondido, travelling first to El Zapotalito and then hiring a boat for about $100-150 pesos (per person) to cross the lagoon. There are rustic accommodations and eateries at both locations, but if you don’t plan to spend the night, you may want to arrange your return transportation with your driver and/or boat captain on your way in.